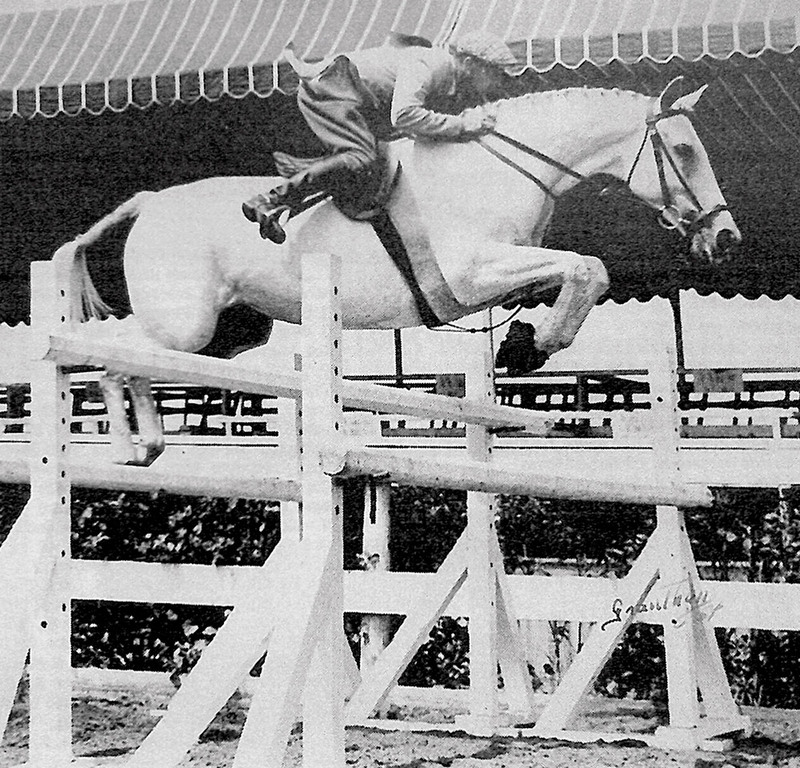 One of the greatest Show Jumpers of all-time comes from the post-World War II era—the 16.2 grey Thoroughbred mare named Circus Rose. She was bred in Virginia by Liz Whitney at her Llangollen Farm in Upperville, and foaled in 1945. Her Jockey Club registration papers show Circus Rose as being by Great War, a son of Man O’ War, but many suspect that she was actually by Mrs. Whitney’s great Thoroughbred jumping stallion, Bonne Nuit. 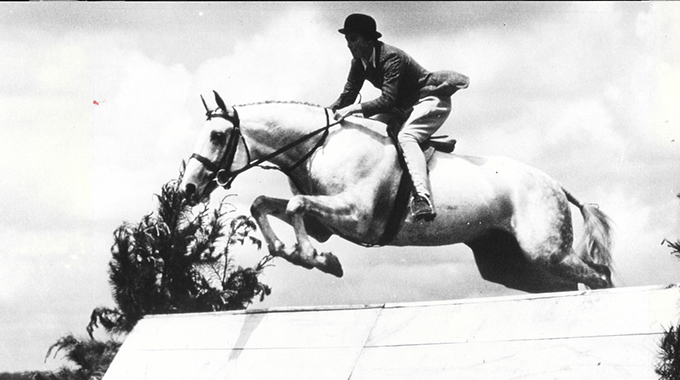 A field hunter named Winter Rose (by Endeavor II) was her dam, making Circus Rose a half-sister to Riviera Wonder (Show Jumping Hall Of Fame inductee, ridden by Al Fiore and Bill Steinkraus) and Unusual (Pan Am Gold Medal winner ridden by Kathy Kusner) plus Snow Bloom (dam of Jumpers) and Perennial (Steeplechaser). Early on in Circus Rose’s career, she was owned and shown by the Master of the Old Dominion Hounds, John Hopewell, who won a lot with her. At the 1949 Warrenton Horse Show, William Schlusemeyer of Warrenton saw, liked, and bought the 4-year old Circus Rose for Joe Green to show. In 1950, with Joe Green riding, Circus Rose amassed the incredible record of 18 Championships and 84 Blue Ribbons out of 27 shows. 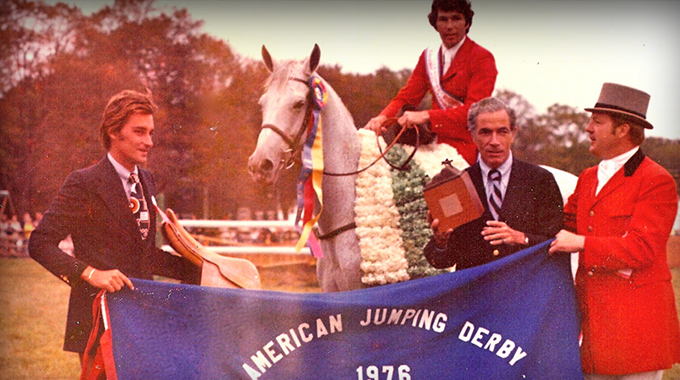 Their year was capped off at Madison Square Garden’s National Horse Show where the 5-year old mare was Jumper Champion. It was there at the Garden that August A. Busch Jr. paid a then-record price for Circus Rose and renamed her Miss Budweiser. 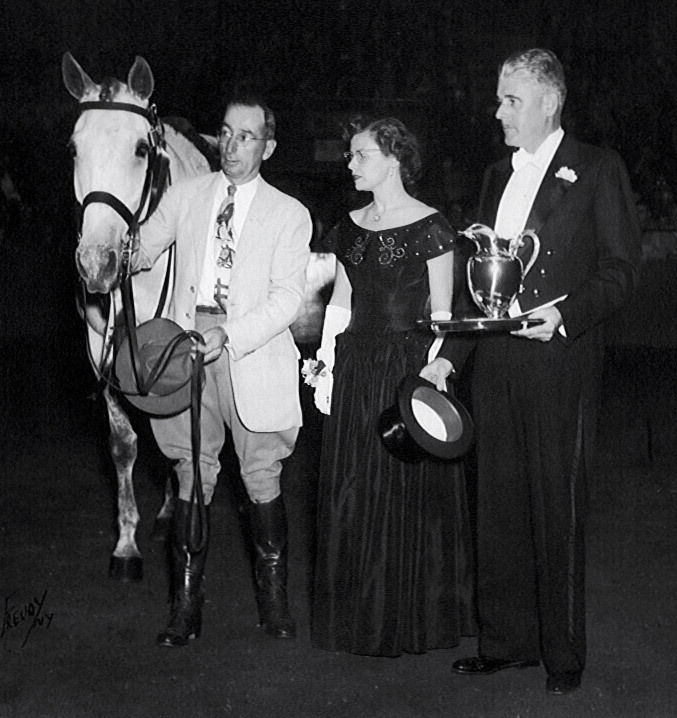 In this image, Joe Green is with Circus Rose during the Open Jumper Champion presentation at the National Horse Show in 1950. 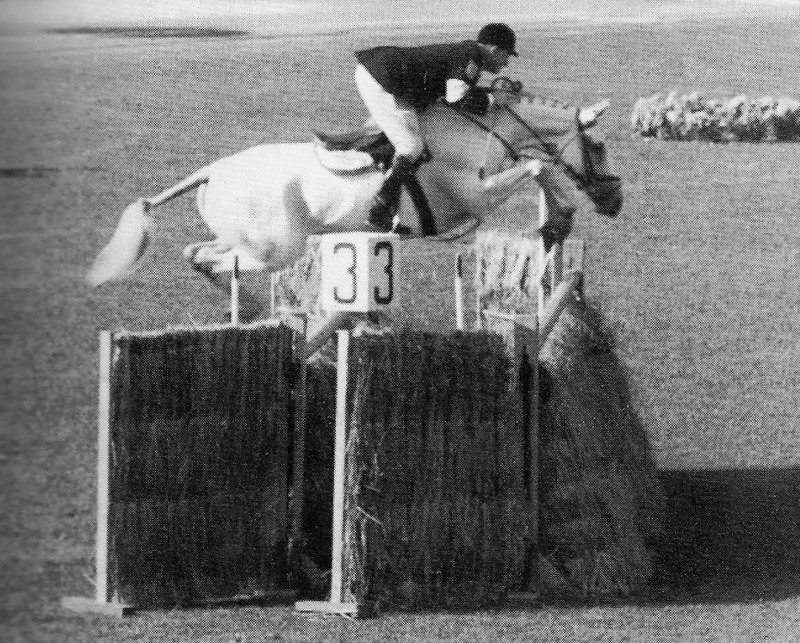 At this time, she was owned by William Schlusemeyer’s High Gate Farm from Warrenton, VA.
Mr. Busch bought Circus Rose for Carol Durand to ride in the Olympic Trials for the selection of the first civilian US Show Jumping team to go to the Olympics at Helsinki in 1952. The FEI had a long-standing rule that no women could compete in Show Jumping and they declined to revise the rule for Miss Durand. The reins of the superstar mare were turned over to US Team Captain, Arthur McCashin. 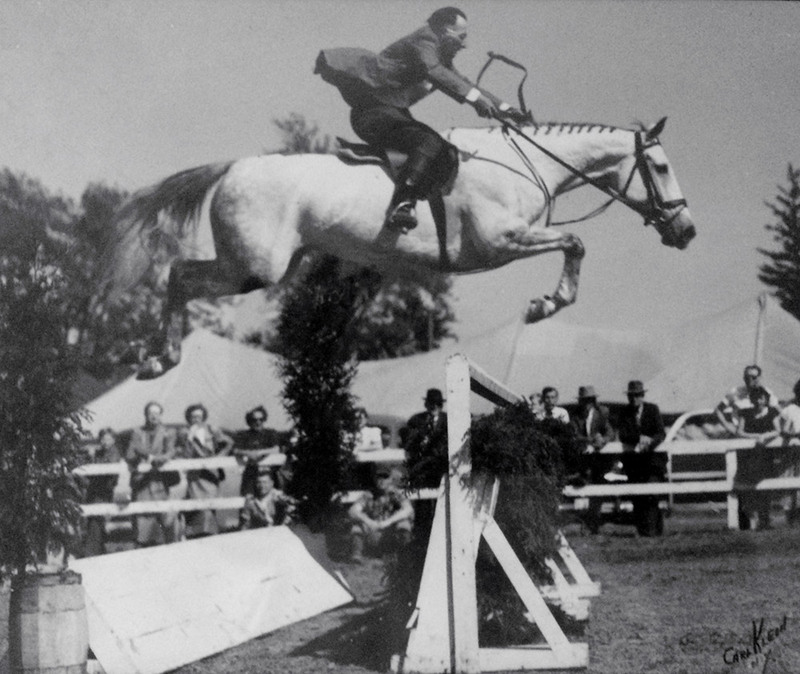 USA Show Jumping Team Captain, Arthur McCashin, on Miss Budweiser (formerly Circus Rose) contributing to the United States’ Bronze Medal at the 1952 Helsinki Olympics. This was the first Olympics that the US had a civilian team. 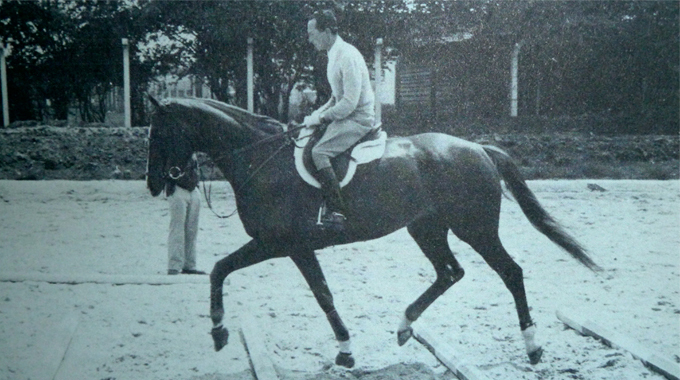 Miss Budweiser was owned by August A. Busch Jr.
With Mr. McCashin riding, Miss Budweiser won the Preis St. Georg at Dusseldorf prior to the Olympics and then placed 12th Individually at Helsinki, which helped the US win its first Team Medal at an Olympics – a Bronze. Bob Egan on Miss Budweiser in 1956. She was still owned by August A. Busch Jr.
After the Olympics, Miss Budweiser went to Mr. Busch’s Grant Farm in St. Louis where she continued to show some with Bob Egan riding. With Mr. Egan on board, “Miss Bud” had some success in the Midwest, most notably retiring the Jumper Champion trophies at Oak Brook and Lake Forest, before being retired. The Show Jumping Hall Of Fame inducted Miss Budweiser into their class of 2009, but we Virginians will always claim Circus Rose as our own, so when she was inducted into the Virginia Horse Show Hall Of Fame in December of 2015, she was inducted as Circus Rose. Excellent article, educational, historical, and well written – oh, and of course, an amazing thoroughbred. Thank you Lynn, we’ll be sure to tell Marianne! So glad you liked it. Thank you for writing such a wonderful article about my Dad’s horse. It’s fun to see online the pictures that I grew up with in our family den. She was an incredible jumper and a beautiful thoroughbred. Thank you! So thrilled to hear you liked it! It’s an amazing story. Must have been very cool to see her in action! My cousin, Cynthia, and I weren’t even born yet. As a bona fide horse-addict, I always loved the picture of Circus Rose in the den at my aunt’s house. Looking forward to seeing old Friends both Horses and people. Seeing August A. Busch Jr. mentioned brought back memories of my good friend. He always took a little time out of his busy day to talk with me when our paths would cross on the Horse Show circuit or in the Charlottesville/Keswick area when he came for a visit. That is so cool! Thanks for sharing it with us Doug.